SANTIAGO, Chile, April 25, 2015 (ENS) – The Calbuco volcano in southern Chile erupted this week for the first time since 1972. Blown in a north-easterly direction, ash from Calbuco traveled as far as southern Brazil on Saturday, prompting some airlines to cancel flights across Chile, Argentina and Uruguay. 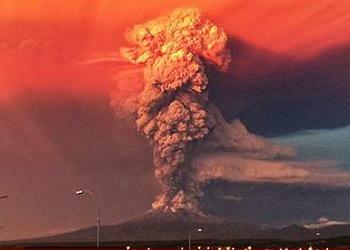 The eruptions began late Wednesday as the mountain shot smoke and ash plumes more than six miles into the atmosphere. As lightning illuminated a dark red-orange sky early Thursday, Calbuco erupted again. More smoke rose from the volcano Friday. Patricio Cartagena, the director of Chile’s National Mining and Geological Service, told reporters on Friday that the volcanic eruptions could last for weeks. On Wednesday, at least 5,000 people were evacuated from the Los Lagos (the Lakes) area about 1,000km (600 miles) south of Chile’s capital Santiago. The government of Chile established a 20 kilometer radius evacuation zone, and about 1,500 people in the hill town of Ensenada were ordered to leave. Authorities said the evacuees from the towns of Chamiza, Lago Chapo and Correntoso would stay at shelters in the nearby city of Puerto Montt. The government declared a state of emergency after the first eruption and a night time curfew was enforced. But some residents chose not to evacuate in defiance of government orders. President Michelle Bachelet Bachelet traveled to the Los Lagos region Thursday with a team of ministers including: Health Minister Carmen Castillo, Agriculture Minister, Carlos Furche, Public Works Minister Alberto Undurraga and Economy Minister Luis Felipe Céspedes. In the town of Puerto Montt they met with local authorities and survivors. 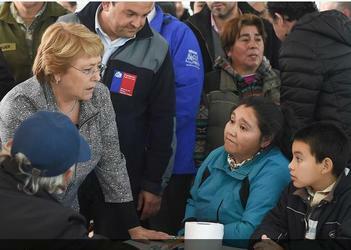 “Eleven shelters have now been set up, there are about 50 people at the shelter in Puerto Varas and the total number of people evacuated continues at around 4,150,” Bachelet explained after the meetings. “Air and ground teams, along with the National Mining and Geological Service, have been dispatched to fly over the affected area and assess the levels of volcanic activity, locate people or families who may be trapped and investigate reports of a missing person,” she said. After chairing a coordination meeting with various ministers regarding the eruption, Bachelet issued an update on the emergency and confirmed that “there has been no significant change to the situation. “The ash plume currently measures around 11 kilometers and continues in a north-easterly direction. The characteristics of the volcanic pulse reported early this morning remain the same and are expected to decrease,” she said. Fresh evacuations were ordered Friday as ash and mud from the volcano were found in a river close to the mountain. The smoke and ash plumes emitted by Calbuco’s eruptions have caused Delta Air Lines, Air France, American Airlines, Air Canada and Qantas Airways to cancel flights to the capitals of Chile, Argentina and Uruguay, stranding thousands of travelers at airports.